concept for the next limited edition. The ambition was to capture the soul of Absolut, expressing creativity and quality as its cornerstones – and the experiments paid off. Releasing a drop of cobalt blue into the glass only takes a millisecond. It’s added just as the molten glass goes into the mould at 1100°C. At that temperature, the cobalt is invisible, but as the glass cools off, a beautiful and unique blue infusion appears inside the glass of each bottle. 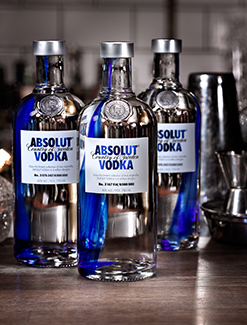 “The streak of cobalt forms a sophisticated contrast to the crystal clear glass, and the blue colour makes each bottleunmistakably Absolut. This classy remake celebrates the original thinking that has always been the Absolut creed and pays tribute to the world’s most iconic vodka,” continues Mathias Westphal. GAME, SET, MATCH…BELVEDERE!As Wimbledon season approaches, Belvedere..